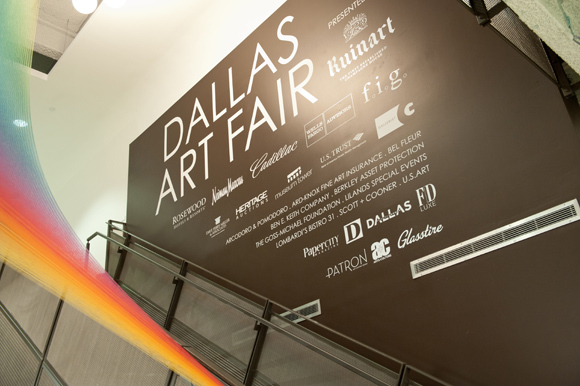 The fifth annual Dallas Art Fair, presented by Ruinart Champagne,will return April 11 through 14, 2013 to the Fashion Industry Gallery (f.i.g) located at 1807 Ross Avenue –adjacent to the Dallas Museum of Art in Dallas’ dynamic downtown Arts District. This year’s fair will showcase over 80 international and national galleries. The Dallas Art Fair launches on April 11, 2013 with an exclusive preview gala that will once again benefit the Dallas Contemporary, the Nasher Sculpture Center, and for the first time in 2013, the Dallas Museum of Art. The gala offers patrons and top collectors the opportunity to preview and purchase exhibited works prior to the public opening of the fair. In conjunction with the main fair, Caja Dallas, a collaboration between SEVEN and the Dallas Art Fair will be held at the Dallas Contemporary. SEVEN, the pioneering collective project organized by galleries including BravinLee programs, Pierogi, P.P.O.W., Ronald Feldman Fine Arts, Catharine Clark and Inman Gallery focusing on artworks through a collaborative, exhibition-like presentationco-mingling galleries and artists. This year’s edition is at the center of a week of major exhibition openings and art-related programming in Dallas. Notable exhibitions include Tobias Madison and Emanuel Rosetti at The Power Station; Ken Price at the Nasher Sculpture Center; Dan Rees at The Goss-Michael Foundation; Walter Van Beirendonck at the Dallas Contemporary. “The Dallas Art Fair is a destination event attracting an international audience to the dynamism of the Dallas arts community,” said John Sughrue co-founder of the Dallas Art Fair.